Want to Save the Environment? Buy Less Stuff! A few weeks ago I wrote about my realization that I have too much Stuff. For two decades, I had been a willing participant in our consumerist culture, buying books and magazines and video games and compact discs and George Foreman grills. After twenty years of this, all I had to show for it was a mountain of debt and a home filled with Stuff. Recently, Kris and I have been working to purge our Stuff. While we've discarded some of it as trash, we've also managed to sell some of it. We've donated some of our Stuff to charity. We've given other Stuff to friends. At first this was painful. Then it became appalling. It was shocking to think that I'd paid tens of thousands of dollars to buy this Stuff, and then paid even more in interest fees. Now I'm casting much of it aside, shipping it off to a landfill. Reduce your consumption — buy less stuff. Such a simple notion, yet so powerful. The less you buy, the less money you spend. When you buy less, you're also reducing your environmental impact. Buying fewer things means a little more money in your pocket, and a little less pollution in the world. Reuse the things you have. Last week, Amanda encouraged us to get value from the things we own. Before you buy a new computer game, ask yourself if you're finished playing the last one you bought. Before you buy a new bicycle, consider taking your old bike in for a tune-up instead. If you currently buy disposable diapers, disposable razors, or paper towels, consider switching to re-usable alternatives. Recycle the Stuff you no longer want or need. If you replace your 1996-era 19″ Sony television with a new widescreen model, don't set the old TV out in the trash. Find another home for it. Put it on Craigslist. Set it outside with a “free” sign on it. If you really want to save money, place yourself on the other side of the equation: look for Stuff that people are getting rid of. You can find nearly everything you need for much less than you'd pay new. You just need to know where to look! Hand-crafted goods may contain minor imperfections. Organic fruits and vegetables often have visible blemishes that do not affect the quality of the food. The things you find at garage sales and thrift stores will often require mending. All of these flaws can be disconcerting at first, but in time you may find yourself wondering why they once bothered you. Pursue quality. I used to buy a pair of $3 gardening gloves every spring because I didn't see the sense in spending more. They'd work fine for a couple months, but by the end of the summer, they'd be worn to pieces. Then one year I bought a $15 pair of gloves. I haven't bought another pair since. We often assume the least expensive option is the best way to save money. That's not always the case. Quality items usually have a higher initial cost, but the total cost of ownership can be much less than a cheaply-made equivalent. These rules can be difficult to follow — I've been working on some of them for years. Most of the time, I still think like a consumer. But because it's important to the environment, and because it's important to my bottom line, I'm willing to keep trying. There are 67 reader responses to "Want to Save the Environment? Buy Less Stuff!". You have a good point when you say to “pursue quality”. I tend to be the one who will buy the cheap item thinking I’m saving money, while my husband is more likely to spend a little more to get something that will last a little longer. Value is not just a bargain price, it’s a balance of price, quality and longevity. I’m glad I have him around to help find that balance. I too grew up believing things only cost what the price tag said they did. It wasn’t until I learned about the psychological burden of too much stuff, the untold costs to the environment or marginal workers & the subliminal need to use money to meet emotional needs that I began to view material objects in a new light. This new perspective on money had also heightened my awareness to monitor what messages I allow to enter into my thought process. I now view television, especially the outlandish ads or over-the-top shows, with more cynicism and contempt for their blatent materialism. I refuse mindlessly spend money anymore, without any realization of the short and long term consequences. 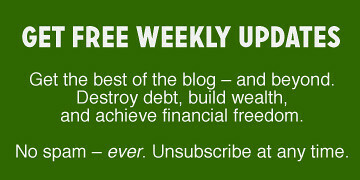 I also think that subscribing to several daily blog feeds on personal finance keeps me focused on being a responsible consumer & financially accountable. You’re absolutely right. As I’ve got older I have found myself buying less rubbish and not wasting money, which is good, but my problem is that I just can’t throw anything out, and I just end up hording all this stuff I don’t need around the house and in the loft. Your argument that you can simply buy less stuff and save the environment may have one flaw. Is it not simply delaying the inevitable? You may buy stuff at a slower rate but you still are purchasing and using items, thus generating waste. The only way I see for this to be solved is not through individual initiatives but through internalizing the true cost of an item. If you went to the store and bought an item and paid for both the cost to create (manufacturing) and the cost to recycle the item then you would be pre-paying for the environmental cost. This would then reduce the equilibrium amount of stuff you could buy. It would be impossible for this to be implemented correctly due to problems in government and lobbyists but it would be the ideal way. That said, I have no problem with individual conservation so by all means buy less, if only to make things cheaper for me. We went through a mass de-cluttering when we moved from Seattle to OK. I believe I threw out about half of our posessions. And we still have some more in our home that we could trim. Not only is de-cluttering good for the environment – it’s good for your peace of mind as well. I’ve noticed myself feeling far less distracted since ridding ourselves of our extraneous crap. I have less things to pull my attention away, less goods to maintain, and less to clean. I like the tension between embracing imperfection and pursuing quality. Both are important, but you have to know when to do which. And sometimes quality has imperfections…such as a good quality piece of furniture with a scratch which won’t be seen and brings down the price. Or a great winter coat which just needs a new lining but can be bought for $5 at Salvo. After reading all of your entries about purging I decided to follow suit. This was my first real weekend off of work with no plans in months. My wife and I spent almost the entire weekend going through our belongings. I threw out old unusable clothes and broken items that had been hanging around. I filled 4 garbage bags full of junk, and have 5 large garbage bags and 4 boxes of clothes and infant toys to be taken to goodwill. I managed to fill to boxes of books I really didn’t need and had lost any interest in holding onto. The biggest shock was seeing the number of books that I had two and sometimes even tree copies of. Many of those were hardcover books. The end result is our place looks cleaner, my bookshelves look neat and organized and we now have extra storage space when before we thought our place simply did not have enough. Its taken me a while to be willing to do this but now that we’ve started I have several more books I’m eyeing to get rid of and a few pieces of furniture I would like out of the house. This is exactly what we did! Craigslist has helped me a ton the last time I moved and it’s great to be able to help other people out and give these items a new home. Had I not listed the TV on Craigslist, it probably would have eaten up storage space as I’m not exactly sure the best way to dispose of large electronics like that. Ever try freecycle? Don’t buy it – see if someone else is giving away something you want. You don’t want it? Give it away. I have had nothing but good experiences with my local Freecycle mailing list. I have been participating for about six months. It’s been great fun and an easy way to give away things I no longer want. For example, we recently replaced an old ceiling fan with a fixture that took CFL bulbs. I posted the ceiling fan on Freecycle, and within 15 minutes had three people respond to my email. Within 5 hours, it was gone. I’ve listed many items as “offers” and responded to even more “wanted” ads. Most people ask for simple things that most people have laying around – I’ve given away the bamboo growing in my back yard, old magazines, leftover yarn, craft supplies, and a child’s backpack, among other things. You mention that “Kris and I have been working to purge our Stuff.” I’d like hear more from you (or your readers) on getting your spouse or S.O. to join in the purging. I’ve been on a simplicity kick for nearly a year now, slowly going through boxes of junk and discarding, selling or donating 99% of what I’ve across. My wife, however, seems to have a much stronger attachment to the piles of stuff accumulated over the years. So, have you got any gentle tips or dirty tricks for weaning someone off of their Stuff? I am a HUGE proponent of craigslist. My wife and I moved to Portland, OR from the midwest about a year ago and it has been a vital resource to us. In the past year, we’ve bought a stove/oven, pool table, futon, guest bed, even chickens from local people for amazing prices! And not only that, in an effort to purge our own possessions, we sold a Nintendo 64, PS2, Macintosh G5, and most recently, two chickens (all of which gave us a higher profit margin than ebay could have). It may not be useful resource for consumers in every town, but since we’re so close to such a huge city, it seems like we can get any used item at a very reasonable price while helping someone else recycle instead of taking their items to the dump. Even right now I have an RSS feed setup to tell me when someone in the community posts a recliner to craigslist for under $50 – it’s a simple way that my wife and I try to take part in recycling. Why not give it a try and see what’s available in your community? If you don’t see many items available, post some of your own to get it started! There are other costs related to clutter: just this past weekend I read a real estate article written by a property “stager”. She said something to the effect of: “clutter eats your equity”. So in effect, you are decreasing the appeal/value of your property in the eyes of buyers if you have piles of junk. Also, I have read that clutter can affect your “thinking”. Something along the lines of it is more difficult to think clearly if you live in clutter. I’ve always been a “collector” kind of person. This may have something to do with how much time I spent at my grandparents’ house growing up… They’d lived through the Great Depression & saved darn near EVERYTHING. Recently, I’ve started becoming more aware of how much STUFF (aka clutter) we have. I’m starting to think more about buying things. Do we NEED it? Is there a place to PUT it? I hate throwing things out, so Freecycle has been a great discovery for me. But we’ve got a lot of things that I don’t want to just *give* away, but I’m finally accepting that I’m too lazy to get a yard sale together. So I’m thinking about doing a yard sale in a “take my stuff for whatever donation you want to leave.” I may not actually make much from it, but it’d get stuff out of my hair AND make me feel like I’m at least making SOME $$ from the better stuff. Another benefit to thrift/recycling is that you don’t have to worry so much about how your spending habits affects the trade imbalance. I buy thrift store clothes almost exclusively and as a result I don’t worry when I see that my clothes are made in China. Instead I know that I supported a local business – usually a charity – with my purchase. For quite a while now my rule has been to consider where I will put something, and how I will maintain it, in addition to how frequently the item will be used. Everything we buy costs us, not only money, but a piece of our lives. First there is the time we spent to earn the money to buy the thing. Then there is the time we spent shopping for it. And finally there is the time and money spent maintaining it. How many people ever consider the latter? And on the question of quality, there is the whole discussion about which things are worth the extra money. Personally, I won’t spend much for a pair of gardening gloves, but I wouldn’t want to garden without my Felco pruners! My wife and I have a crockpot that has seen better days, but is still essentially functional. One of the plastic feet broke off, and the temperature selection knob broke off. One day, after propping up the crockpot on a measuring cup and fumbling with the shaft for the temperature control, I declared that we needed to get a new crockpot. About five minutes later, I had a revelation: I could trim a cork down to size to use as a foot (readily available at your local hardware store, or in a bottle of wine), and use a generic control knob with a set screw (again, hardware store or radio shack) to replace the broken knob. Total cost? $1.00. A new, decent, crock pot costs at least $20, plus there’s a ton of packaging to deal with. So I have been trying for a few years to cut back on non-essential stuff… and having to move every year or every other year (I’m a student) has definitely helped with that. But one problem I keep running into is family. My family loves to buy me STUFF. They don’t generally care if it’s useful, to them it’s the thought that counts and the gift is a gesture of their love etc etc etc, especially because I live far away from them. I’ve tried explaining to them that I’m trying to cut back on accumulating stuff, and also all the reasons not to spend money on things that won’t actually get used, but so far it hasn’t worked. Every special occasion that goes by comes fraught with STUFF sent to my doorstep, and it’s rarely anything useful. Every visit from family ALSO comes fraught with MORE STUFF. The problem is, I’m not allowed to sell it or give it away! How do you declutter in a situation like this? Advice, anyone? I think of your “pursue quality” suggestion as my personal “shoe rule.” One of my college roommates taught me that it was okay to buy more expensive shoes because they tend to last much, much longer than the cheapies I’d been buying. I now buy only one or two high-quality pairs per year (if that), and they last a good long time. It’s a great philosphy for me – it’s easier on the environment & easier on my brain (less clutter in my closet and less need for the continuous buy/throw out cycle), and I try to apply the idea to other things I buy as well. I’ve done this for the past three years, but not in the most ideal way. I play City of Heroes (a MMORPG). In the past three years I’ve only bought one other computer game (Civ IV) but have been paying the monthly fees ($15/month) for CoH, which equals about one new game every three months. That said, the company that makes CoH has been continuously introducing new content, which I justify is equal to a new game. Now, I won’t get into the amount of time I’ve spent in the game, that is another issue that I know you were familiar with. At least I’m not hurting the environment by playing a MMORPG. I used to get calls from local charities looking for donations every couple of months. Sometimes I had STUFF for them, sometimes I didn’t. Now I have started calling them every month. Bit by bit, a lot of crap I don’t want is leaving this house. I have the debris of 20 years — including a lot of stuff my ex-husband failed to clear out before he left — in the basement, and while some of it will have to be hauled out by commercial junk collectors, most of it can go out to charity or the garbage. It’s not just that I’m getting rid of clutter, especially clutter with unpleasant associations. As I go through box after box, I’m finding things I really cherish, like family photos or my mother’s old china that are now coming upstairs to be actually seen and used. You’ll have to excuse me now. I have a couple of bags to fill with old clothes and old books to get ready for an 8 AM pickup tomorrow, and yet more ancient financial statements to shred. JD, this article reminds me that I want to recommend the book “Not Buying It” by Judith Levine. I originally heard about it from an interview with the author on NPR during Fresh Air with Terry Gross. I think it’s a very good read and deserves a place on the bookshelf of anyone concerned about personal finance, the environment and our modern culture. The book is really not about saving money, nor is it specifically about the environment. It’s about a woman and her partner who decided to only buy “essentials” for an entire year. Basically, they rejected as much of the consumer culture as they could. In the process, though, she managed to save around $8000. When I finished reading this book, I started thinking about every purchase I make. Why am I buying this? Do I really need it or even want it? Or am I just attempting to fulfill some unmet emotional need? This led me to start reading more about personal finance, so that I could get my budget in order and allow for the occasional mindless (but cheap) purchase. Anything else, I want to make sure it’s a purchase of value, that I will enjoy it, and not because I’m fighting with my family or had a bad day at work. Maybe you could post your own GRS review for your readers. We often assume the least expensive option is the best way to save money. That’s not always the case. Quality items usually have a higher initial cost, but the total cost of ownership can be much less than a cheaply-made equivalent. This is exactly why I hate Wal-Mart and avoid it as much as possible. Wal-Mart sells cheap crap, and that’s exactly what it is – it is cheap, and it is crap. I would much rather buy fewer things, and have good quality things that will last, instead of cheap crap that needs frequent replacing. Fortunately, my wife shares this philosophy with me, and as a result we buy few things – but always quality things. Actually, I did get taken recently: I bought a few store-brand shirts from a national chain. Every one of these started falling apart after only a few washings – some after the first washing. Contrast that to the other quality shirts I have bought – several of them are years old and, except for some slight fading, are as good as new. Like many others who read GRS, I’m trying to be more conscious about my acquisitions, and to simplify my life. But sometimes I do wonder about the macro-implications of the simplicity life style. If everyone — or even a lot of people — begin to really live in a less-consumerist way, there would be large economic effects. When people eat out less and purchase fewer items, what happens to those who work in retail and in food service? There was a real fear among the political class after 9/11 that people would stop buying things and that there would be a very difficult economic situation if that happened. Similarly, what are the macro-environmental effects? Would it be better if the exporting countries no longer had markets for their goods? Would that lead to less impact on their environments? I think I have read that in African countries the move to an export economy has been bad for the environment, but it appears in other places that living standards have gone up as people began to have an export economy. How ironic to read this as I have been preparing to sell a lot of my “must have it” stuff in a garage sale this weekend. Just today I priced one of those foot spa massager things. I literally HAD to have this, spent $35 on it, and used it once. It has been sitting in a box in the closet ever since. So, now I’ll hopefully sell it for a buck or two this weekend. My grandmother taught me that buying cheap is expensive, and I have seen that throughout my years as a consumer. The first time I saw this was when I bought a cheaper package of crayons. I’ve been loyal to Crayola ever since! I have learned to watch for sales (40% off the already discounted price at Sears) where I can get good quality clothing in my larger size for a very good price. I don’t necessarily get the variety of choice – but the advantage is that it isn’t as difficult to make a decision. For example once there were two pairs of shoes – black and red – and I bought them both – five years ago. I’ve worn out the black pair but I’m still enjoying the red ones! If there are no shoes, I don’t buy any. Same with pants, tops, anything I look at. Because I only shop at this particular sale, I end up not shopping alot. And I very rarely go to dollar stores for the same reason. Too much choice and too little quality! My consuming less stuff act this week was to purge my bookshelves of several paperbacks I accumulated in college and taking them to the used book store. They gave me $12 in store credit in return, and I bought a used copy of “Your Money or Your Life” (per this blog’s suggestion!) and “The Cosmos” by Carl Sagan and a few scifi paperbacks for my boyfriend. We ended up spending another $1.60 on top, but all in all it was a great deal! 1. We have far, far too much cheap crap from other countries, countries with horrible human rights records (*cough*China*cough*). If we didn’t buy that stuff on a large scale and everyone scaled back, we would cut the flow of money to countries that are doing some very not-nice things to their neighbors as well as their residents. 2. We are in a serious trade deficit and have been for some time; this means we buy more goods than we make. So, all that manufacturing is providing jobs for somebody else outside our economy. 3. The service industries may or may not take a hit if this happened large scale, but who is to say that’s a bad thing? Probably fast-food chains would be hit hardest, because I certainly still go on nice dinners with my husband and tend to cut cheap “convenience” meals. 4. Is it worth it to worry about it? Industry has to adjust to the lifestyles of consumers, not the other way around! And, as far as not buying crap goes, here’s a hurrah from me! We are down to the last boxes from our storage unit and have gotten rid of over half our belongings this summer. Not only do I NOT want to buy stuff to replace those belongings, it is such a relief to have less in my house to sort and clean, and more places to put the things I really love. I found pictures, poems and other cherished items that were languishing at the bottom of junk piles and now I get to enjoy the things I love. NOT buying stuff does help the environment — in particular, mine! elisabeth, that is a very good point. and something that the book I’m plugging didn’t get into enough. she focused a lot on the negatives of consumerism and the personal and environmental effects, but not enough on the positives. it’s so hard to figure out what are the “best” choices. but I think it’s something when you at least try to figure them out. It’s too bad I didn’t know about the toll clutter can take on your life 4 years ago before I registered for mountains of stuff for our wedding. I’m glad that I was raised to donate things we no longer use. I get a warm feeling knowing that something I can’t use any more is getting use from someone somewhere. After seeing the amount of stuff we’ve hauled out of our house lately I’ve started trying to make better decisions about what we do buy. Quality has a higher value that I need to take into consideration. My wife and I were just having this discussion too. We’ve owned three houses in our 5 year marraige, a 102 year old farm house, a 30 year old piece of junk and our newly beloved 85 year old city home. Another interesting angle to examine the “stuff” problem is from the American culture of gifts. I’ve always felt comfortable giving and receiving small, humble, homemade gifts but have recently been bombarded with the gift issue in my workplace, where there constantly seems to be a shower, birthday, or “holiday” requiring a gift exchange, and it seems an unwritten rule that a $20 gift is the norm, despite our relatively low salaries. If I don’t buy something obviously nice and new, I feel that I’m being a selfish cheapskate – but if I continue to spend the $20 minimum roughly once a month, I have barely any room in my gift budget for actual family members. I guess it’s another “working tax” to take into account for my true hourly wage! I agree with all the people who love craigslist. As a newly married college couple, my husband and I didn’t want to spend a lot to furnish our apartment. We used craigslist and our college classifieds and found a lot of great stuff. As far as “quality vs price,” I think you can go too far either direction. I definitely like to have nice stuff, but you have to decided if it’s worth it to you personally. For example, we paid $400 for our bedroom set, used, including the matress. It looks practically new, and nice, but it’s not what would call “quality” – aka solid “real” wood. But that’s ok. Maybe at some point in the future we’ll get a nicer one… once we’ve settled into a house andwon’t have to worry about moving it for a while and have some extra cash. But for now we have something that looks nice and accomplishes all the purposes it needs to. One way to avoid purchasing items is to learn to make them yourself. My future wife likes to spin and crochet, it is usually pretty easy to get some wool from a local farmer or in our area there is a wool coop that processes wool from local farmers. So she supports a local business, has something to do in the evenings and gets useful things; hats, purses, blankets etc. I also have learned a lot from my father, he is a farmer and carpenter, after a big ice storm there were a lot of downed trees, he has processed the wood into lumber and makes small projects, wooden boxes for storage etc. He also built most of the furniture in my parents house (not to mention the house its self). All solid wood and will last to be handed down to us kids. In my teens and early twenties I collected several thousand books (yes, I read them all too). They looked fantastic on the shelves, and earned me a reputation as an intellectual. But over the years the stress of moving, which I did at least once a year, started to get to me. The books became a millstone. One particular move, on a rainy day with no friends available to help, was particularly trying and led to minor depression that prevented me from settling into my new place for several weeks. And now, I’m in the midst of several years of overseas travel and work, my books are boxed up in my father’s spare bedroom. I’m over my sentimental and egotistical attraction to them. I have no desire to hoard more, and plan to sell off the ones I have when I get home, freeing myself of the physical and psychological burden. Yep, I couldn’t agree more. I don’t know why it took so long to figure out that I don’t need to buy all of the ‘stuff’ that I see on TV or the Internet. I didn’t know that money should be saved and not spent. I just had no clue! I was being ‘normal’, but normal when it comes to finances is not a good thing. Trying to live a more simple life feels so much better and hey, if it’s good for the environment too, then all the better. The real question is how do we get the message out that there is a better way? It took me piling up $260K in debt to realize there was a problem. I hope I can help someone stop the consumerist lifestyle before they get to that point. Buy less stuff works in so many ways. Not only do you help the environment, but you end up with more cash. Then you need less space to house/store all that stuff. Later you don’t have to repair/replace or think about that stuff. Someday you won’t have to throw it out. Another strategy: Live like a nomad. Nothing helps you to judiciously purge clutter (or to refrain from acquiring it in the first place) like the knowledge that you’re going to be moving and taking it with you, but that a lot of the extra stuff will either be lost or broken. Easier than replacing it or bothering with insurance companies is simply never buying it in the first place. I’m really trying to embrace a more minimalist philosophy now, and I’m happy that technology is converging to make it easier. I really enjoy listening to music, and I feel that it’s the proper thing to do to buy the music I want. Stores like iTunes and AmazonMP3 (only the DRM free versions, thank you very much) help me get the music I want without physically cluttering up my space. As soon as I’m out of debt, I want to get a scanner to start digitizing documents. I think that with some good scanner presets, it could be a really painless way to stay organized. As well as Freecycle I’ve become strangely addicted to http://www.swapshop.co.uk (presumably there are similar non-UK sites). We haven’t bought a computer game in six months. We’ve just traded them in each time on Swapshop. We get more games this way and only pay for postage. When I feel like shopping I can simply use up the stored points on Swapshop. We’ve also tried to resurrect some of the wartime spirit of ‘Make Do & Mend’. The satisfaction of repairing cushions, cheese graters and transforming old clothes has been bizarrely huge. Im not so sure that reducing consumption will better the environment. If we took this to the extreme, and everyone in the US reduced consumption, the economy would contract. Now maybe that’s a good thing because too much junk is produced and there’s too much conspicuous consumption. We recently bought a house so fighting the urge to go to Lowes and buy a ton of stuff but we decided to buy only what we need and buy quality stuff. So far it has worked out for us. It can be really easy to donate your used goods. I must be on some list because I get calls very regularly asking if I have any donations. Different organizations come to me to pick up the items and leave a tax receipt on my doorstep. Our small one bedroom apartment has way too many things. We try to justify it by saying it’ll be needed when we buy a house (a goal we have for next year). I’m realzing that we can at least start by throwing out old magazines and giving some of our books a good home. We don’t use many of them anyways, they are just taking up space on the bookshelf, under the bed, on the desk, etc. Find a different leisure activity – Many people accumulate stuff because, to them, shopping is a leisure activity. You feel like unwinding and getting out of the house (or office), so you go to your favorite specialty store and walk around, thinking you’re just going to browse. Then you end up in the checkout line with an armload of stuff. The best solution is to find a leisure activity that doesn’t include shopping. Stay out of the store and you won’t buy as much. Move into a smaller space – If you’ve got a house with an attic and a garage, you’ve got lots of places to hide all of that extra stuff, so you don’t actually have to think about what a pack rat you are. You’ll only begin to notice when it gets really bad, and then you’ll feel overwhelmed with getting rid of it all. Sometimes, the best solution here is to move to a smaller space. I recently moved from a 2800 square-foot house to a 1200 square-foot condo. It was amazing how much I could get rid of. Live with an anti-packrat – Some people are pack rats. Others are anti-pack rats — they can’t stand clutter, so they’re always getting rid of stuff. If you have a problem with collecting, maybe the solution is to move in with an anti-pack rat. They’ll try to get rid of your stuff on a regular basis, and you’ll hate it. Still, it’s a type of negative reinforcement, and it might make you think twice before buying more stuff. Another great example would be to keep up the maintenance on your car to keep it running fuel efficiently. Also, buying used cars can often be better for the environment assuming the car is still fuel efficient. It is one less old car that is headed for the landfill and one less new car that needs to be manufactured. I love the idea behind thrift stores and goodwill. I don’t feel the need to spend big bucks on an outfit when I could buy an all most identical one for a third of the price or less. I recycle all my water bottles and keep refilling them until they get to be unusable and then recycle them. I drive a fuel efficient used car and buy very few new things. I feel as though if we all took a few less shopping trips a year it would have a major impact on the environment. Some of the posters have taken a swipe at the 800 pound gorilla. The success of our economy is measured by how much stuff we all buy and consume. If we buy less, we chance harming the economy, whose success is measured by GDP and consumer behavior. As people concerned with financial health, we don’t want the economy to stumble (or crash) as a result of thousands (maybe millions) of citizens deciding that they have had enough with stuff. But, the reality is that the economy WILL stumble (or crash) if these changes in consumptive behavior occur. The 800 pound gorilla is the reality that, in order to save the environment, we MUST cut back on our consumption. There is no choice. And the sooner the better. I’m afraid that there is not enough time for businesses to shift to “greener” products and services. This has been very gradual and will not transition soon enough. Besides, consumers continue to chase the lowest cost, which slows the possibility of renewable businesses gaining dominance in our markets. The good news is that ownership and wealth are not the things that most people report making them the happiest. It is possible for the reduction in consumption, and the resultant contraction of the economy, to be a positive thing for many many people. Sure, those unprepared with low paying jobs will suffer. However, those who are frugle, responsible, and recognize that material items do not ultimately bring joy, will adapt. I am optimistic that we will all be better in the end. Let’s pull the bandaid off! Great point. Buy less stuff!! Honestly, the time I think most people find the best to realize how much stuff they have is when you move. People who never move end up collecting more and more stuff. When we do move we either just accept moving everything or go through a purging before the move occurs so we have less stuff we take with us. However, we do tend to still continue to take a lot of just “stuff” with us. This is also part of the reason for the drive of larger and larger homes. Making fewer and fewer actual real starter homes for those of us that are just starting down the road of home ownership. What is good for us in the 1000 square foot range is by no means sufficient for anyone that has been in a home type of situation for more then a few years. They have by this time..directly or indirectly acquired enough stuff that they feel the need to get into a larger place. Its a vicious circle fed by the consumer nature we are fed by “statue” “media” “friends” and other such venues that affect us. Do you really need that dishwasher…no not really but it makes your life easier as an example. Great ideas. I love purging and I am not so into accumulating new things. I am finding myself dreading holiday shopping this year- spending money to buy people “stuff” that will take up space. I don’t want to be Scroogey but I think it’s so stupide to guess what someone might like when I could write them a check for the amount. I guess not everyone on my list is as hyper aware of savings and conservation as I am!! This is a subject dear to my heart. You are essentially defining sustainability. Think of freecycle not just for parting with items you’re no longer using, but also for obtaining items you’re seeking. It’s remarkable how frequently people in your freecycle group can cough the item up for free! This means we are all conserving resources. Conservation is the magic bullet in fighting for our planet’s health. -A more efficient air conditioner. -Using output heat of the AC and refrigerator to preheat water for a hot water heater. I wanted to comment about the idea of pursuing quality. As you and most commenters note, it is often cheaper in the long run to invest in a better quality product that will last, instead of getting a cheaper product and having to replace it more often. In general I agree with that sentiment, but there are some obvious exceptions. If your need is only for a short time, then sometimes the cheaper product will work just fine. Example: When I lived in Germany, I got to see many of the military families that would go over to East Berlin to buy clothing for their children. Frankly, most of the products available in East Germany were shoddy junk. Clothing would fall apart in 3-6 months, for example. However, anyone with small children can tell you that kids go through clothes at an alarming rate – either tearing them up while playing or outgrowing them. It’s often a race to see which happens first. Considering that clothing could be purchased in the East for about 1/10th of the price in the West, it became a good deal for those parents. I still have (and use) a small tack hammer that cost me about $0.25 – far less than it would have cost in the West. This is an extreme example, but the point is that for something with a short life, cheap might be the best way to go. If you are planning to get longer usage from the item, then certainly, go for quality. Great post! One thing that’s good if you are going to put stuff out with the trash that you are no longer using (like your old tv) is to put a note on it. Something that explains why it’s there – or that just says it works. Sometimes people assume that stuff in the trash is there because it’s broken, especially if it’s a bit thrashed, so they may not pick it up. Leaving a note increases the odds that the object will end up recycled rather than in the landfill. I like your idea of buy less. I am trying to get my children into the idea of buying less (not buying at all would be better– so I remind them about saving for vacations) and just exchanging toys with their friends/relatives. My main thing is when I go shopping is to not use the bags given out at the store. I never know what to do with those plastic bags. SO I keep a bunch in my car for those times I do go out. These tips are of course useful, but aren’t they obvious? To me, reading tips about frugal or ecological living doesn’t give much. I’m just surprised that everybody doesn’t know these things. And even though I recycle, consume little and try to live ecologically I think there’s still a long way to go. It’s weird to notice that some people are way off the route. I wish that people wouldn’t settle for tiny changes in their lifestyles (like giving an old toy to a cousin’s kid), but would see things in a more vast perspective. It seems that one little ecological choice frees some people of the natural guilt, and prevents them from making bigger changes! Yes, diapers in the dump are bad – but they have made them a lot more degradable and it does less harm than all those loads of laundry! I have found it particularly hard to declutter with my kids. I do get rid of toys while they are sleeping and rotate the fun ones every month or so, but they seem to constantly be accumulating more. Whether its hand-me-down toys and clothes from friends and family or just papers from preschool, there is a lot of “stuff” that comes with kids that makes my life more cluttery. One rule of thumb I have whenever I “need” something from a thrift shop: I have to take in a bag with me for donation. I make myself pick out some clothes we should get rid of or grab knick knacks or books gathering dust, anything to make an even “trade” of stuff coming into my home. This has worked well for us, we seem to be doing a little better on the clutter front. I find that I shop emotionally – I am happy when I’m buying, but later I find I have mounds of things I don’t really need, or want. But, for a few hours, I feel the thrill of the shopper. I’m a big believer in buying less as well. I do have a few points to ponder. Our buying stuff also indirectly requires more storage (larger homes, garages) and more handling. In some ways, discarding that old TV (or other items) may be best due to higher energy consumption, and again, increased handing (delivering to a friend by car…etc.). Also, organic foods maybe healthier but worse for the environment due to the increased transportation from far away places. So the best decision is to buy locally grown produce, organic or not. I just finished a cross country bicycle trip and lived out of a large BOB duffle bag for over teo months and it made me learn what you really don’t need! Just a note…the Union of Concerned Scientists determined that the choice between disposable/cloth diapers was pretty much a wash (no pun intended). All things considered neither has an advantage if you consider water waste, etc. I’m not sure i’d agree with Rachel above that they are any more degradeable than before. Maybe the super-expensive type you find in Whole Foods but certainly not something like the big brands like Huggies, etc. There is too much plastic in those and they’re not going to degrade much sitting in a landfill. I’m sure you are probably right about this – I was trying to remeber from an article I had read a year or two ago. Although I can think of one big advantage of not using washable diapers…. For one year my husband, baby son and I lived in the carribean – we took what we could fit into a suitcase and bought only the barest of kitchen essentials (we had one pot, 3 knives, 3 forks, 3 plates, bowls etc) Did we miss all the extras that make life ‘easier’ NO. Life was easier by not having them!